Just last week Google finally changed the layout of their SERP and has made it available to all desktop search results worldwide. Unfortunately for SEOs, most of the changes have to do with paid search and not organic (more on this later). Still, understanding the changes and what you’ll be seeing that’s different will have a big effect on advertisers as well as SEOs and other marketers, so the sooner you can get up to speed and alter your strategy accordingly the better. 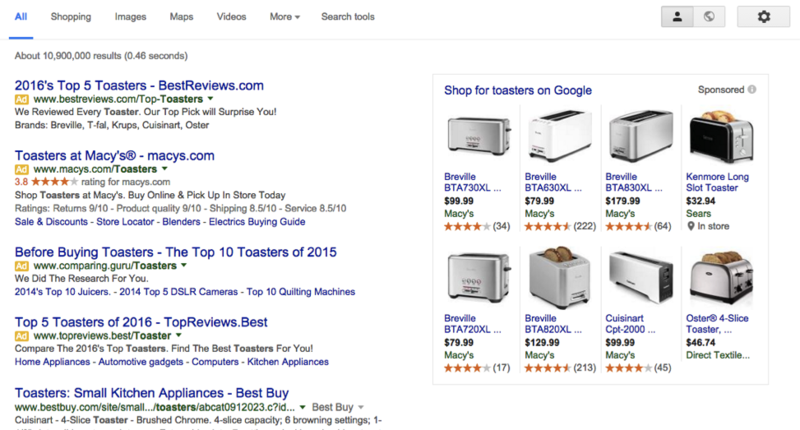 Shopping Campaign ads will still show up on the right-hand side of a SERP. Any ads shown in the Knowledge Graph will not change. So what do I mean by “3 or 4 ads” at the top and/or bottom of the page? The fourth ad will actually only show up for highly commercial queries such as “coffee shops in Encinitas, CA.” In other words, those SERPs will high commercial queries can have up to 7 ads on them at one time, which will now be the maximum amount (as opposed to the previous amount of 11). The whole idea here is to help keep the design simple for users and keep it consistent with the mobile screen, which so many of us are now accustomed to using even more than a desktop when it comes to searching the web. The ads on the right-hand side of the page have always had a lower CTR as well, so it’s likely Google made the change to give advertisers a better chance of earning those clicks and eliminate something users clearly weren’t engaging with in the first place. Although this may seem like a terrible thing for organic results at first, there actually is a positive to the new design. Although there are less organic results above the fold, there will now be more below the fold than there were in the past. They are low down on the page which may turn out to be a significant negative; however we won’t know until the layout has been available for several months, so pay attention to your numbers to see if you see any significant drops in organic traffic. So What Does This Mean for Your SEO Efforts? While it could scare some away and sway them into buying more paid ads, you shouldn’t cut down on your SEO efforts. Start thinking about how you can grow your brand visibility on social media, through YouTube, and in the community to start building relationships. This will help you earn more traffic from direct searches. As far as Google goes, you can try to diversify your funds between SEO and paid search, but tread lightly. Always test and follow your Analytics to make sure you’re making the right choice with your audience. What do you think about Google’s new design? Do you predict it will have a strong affect on organic search and clicks? Let us know your thoughts in the comment section below.